Jack and Joan in the kitchen of their Goodyear Lake home, celebrating Jack’s birthday. A ritual gathering in the Iversen household happened at the end of May: everyone would descend on the house at Goodyear Lake to help repair the dock and to celebrate Jack’s birthday with his favorite German Black Forest Cake with chocolate whipped cream frosting (baked by Joan Iversen, of course). 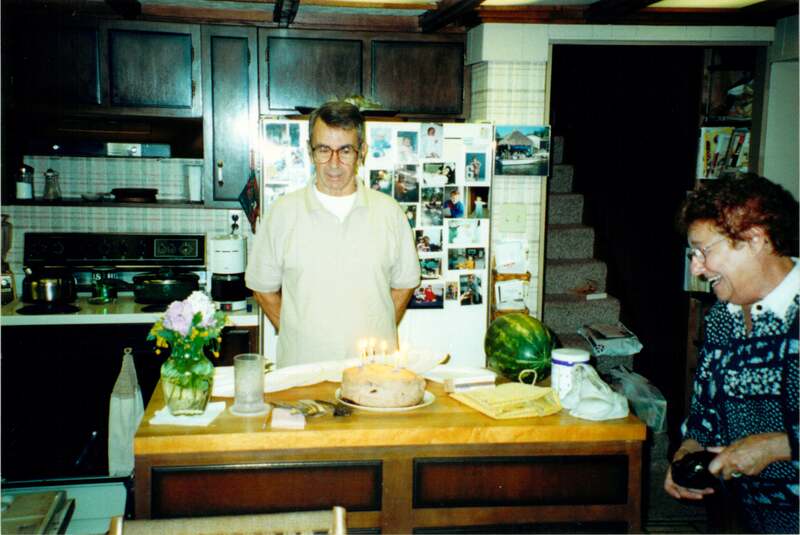 This year, Jack would have turned 84 on May 31st. So it seems especially appropriate to announce, on his birthday, that the scholarship that was established in his memory has become endowed! This means that there are now two scholarships endowed at the State University College at Oneonta, the Dr. Joan Iversen Memorial Scholarship, and the Professor Jack Iversen Memorial Scholarship. A brick in the alumni brick garden at the State University of New York at Oneonta, put there by Mark Deligatti (1975). 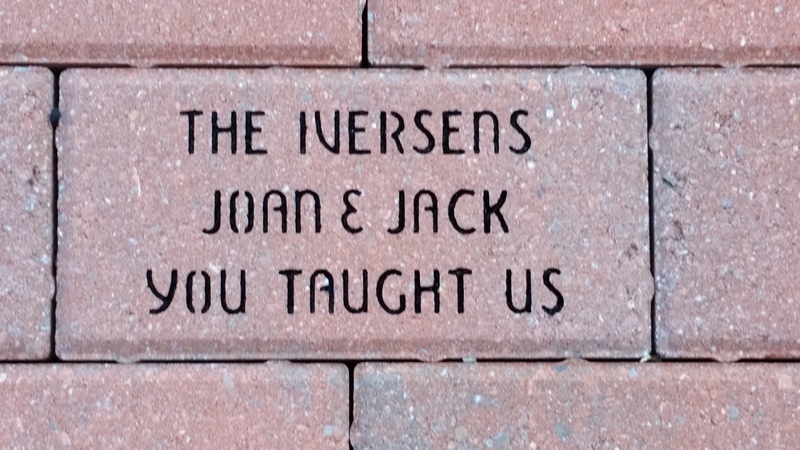 Thanks to everyone who donated to these scholarships to ensure that Joan and Jack Iversen’s legacy continues. And even though they are now endowed, gifts to each scholarship are still appreciated, because larger scholarships will increase the financial impact to the student recipient. Finally, if you drink alcohol, please raise a glass to Jack Iversen on this occasion. His favorite drink was Mattingly and Moore bourbon–it was his last sip before he died, and we all drank some of it in his honor at his memorial service. Both the post (and the scholarship) are such beautiful ways to remember your Dad, Nancy. Thank you for also sharing a recording of the memorial service you had for your father. It was beautiful. It was such a nice way for those of us who did not have the opportunity to be present or the good fortune of knowing your father to get a feeling for how wonderful a person he had been, and how very connected and close he had been to your mother. May you and your family find comfort in all the wonderful memories that you have.